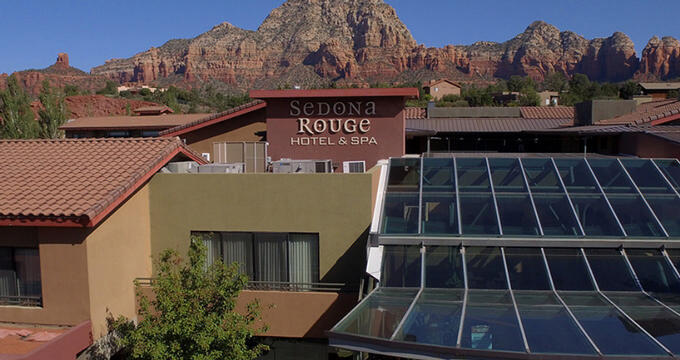 Red is the color that best exemplifies the Sedona Rouge Hotel & Spa, through its Mediterranean design and décor and rusty Red Rock Country mountain view in all directions. The Sedona Rouge Hotel & Spa is the ideal location for guests in search of spiritual renewal, hearty adventure, and a mind at peace. The Almeria Double Queen Rooms includes two queen-size Simmons beds and accommodates up to four guests. In its 500 sq. ft. layout, the comforting queen-size beds with Simmons super plush pillow, satin stitched bedding, pillows, and comforters invite guests to a peaceful slumber. These rooms include a private patio or balcony for guests to step out on for a breath of fresh air. Amenities included in this room include a 42” flat screen television, complimentary high-speed Internet, Turkish towels, Soft Kashwere robes, hair dryer, small fridge, coffee maker, iron and ironing board, along with the daily newspaper and/or DVD player available at the guest’s request. The Almeria Double Queen Rooms are not pet-friendly. The Almeria 1 Queen Rooms include one Murphy bed and can accommodate up to two people. At 500sf, the Almeria Queen is in the stunning Almeria Gardens. The queen-size Murphy pull-down bed ushers’ guests to rest in its lush memory foam mattress, satin stitched bedding, chamber pillows and comforter. The bathroom includes a soaking tub and separate walk-in shower. 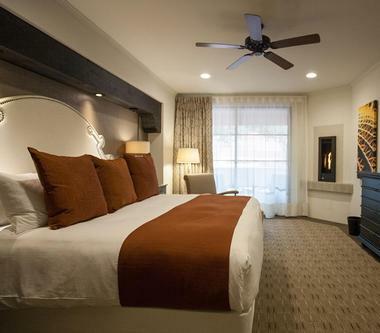 Additional room amenities include a private patio or balcony, fireplace, 42” flat screen television, high-speed internet, plush towels, robes, hair dryer, wet bar with mini fridge, coffee maker, steamer, iron and ironing board. ADA accessible rooms are available to guests. The Almeria 1 King Rooms can sleep up to two guests and include a king-size bed. At 500 sq. ft. the Almeria 1 King includes all the same amenities as the Almeria 1 Queen and Almeria Double Queen Rooms. For guests staying at the Sedona Rouge Hotel & Spa, the REDS Restaurant can provide the perfect dining experience. The REDS Restaurant is famous for its comfort, soul food served in a modern, contemporary fashion. Sedona, Arizona is known for its mystical, healing powers and the REDS Restaurant, likewise, is convinced that nothing can be more healing for the soul than good eating. REDS serve breakfast, lunch and dinner and provides live entertainment each night. Its extensive wine offerings and American style food will not disappoint. Some of REDS most popular menu items include Mussels & Chorizo and Caramelized Sea Scallops. 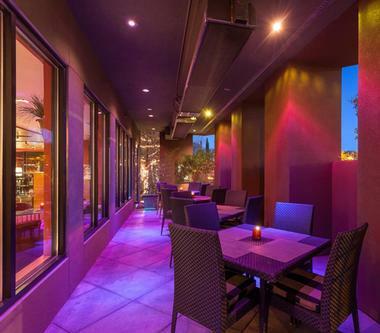 Both locals of Sedona and visitors are invited to dine in REDS’s lively, relaxed atmosphere. 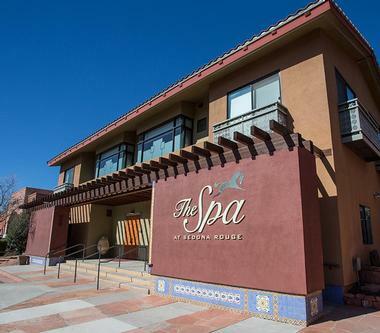 At the center of the Sedona Rouge Hotel is the Spa. The Spa’s trained, certified professionals invite guests into their sensory refuge, where the healing can take place through a combination of touch and pure scents of flower oils and earth elements. The therapists of the Spa are specialized in many bodywork modalities including Reflexology, Cranial Sacral, Cupping Massage, Myofascial Bodywork, Lomi Lomi, Thai massage and Ayurvedic services. For a totally unique spa experience, guests are encouraged to personalize their massages to experience maximum healing. The Spa at Sedona Rouge also offers body treatments incorporating rich butters, invigorating scrubs, detoxifying herbal wraps and scented baths. Experienced estheticians provide guests with a customized facial experience, depending upon the uniqueness of each person’s skin. The facial is designed for each spa guest to be able to experience glowing, healthy skin. The Grand Canyon Package is available for guests longing to witness the beauty of the Grand Canyon firsthand. Guests can choose to take a one-day trip from Sedona with a self driving tour, van tour or inclusive Grand Canyon Deluxe Tour for two, traveling along the southern edge of the Grand Canyon. The Sedona Rouge Hotel & Spa partners with the Bird Golf Academy to provide its guests with a world-class golfing teaching experience. One or two students work closely with a professional golfer in three, four or five-day schools. For guests looking for a mountain biking adventure, Sedona, Arizona is a prime location. With many bike routes throughout the backcountry of Sedona, guests can explore the famous Red Rock canyons from the seat of their bike. Over the Edge bike shop in Sedona can also provide guests with additional information and knowledge about the many trails and bike routes available. Sedona also offers over 200 miles of hiking trails for visitors. The wide range of trails include shorter, smoother ones to more challenging, rough courses. The biking and hiking trails are excellent opportunities for guests to view the lush desert vegetation and unique rock formations that Red Rock Country has to offer.